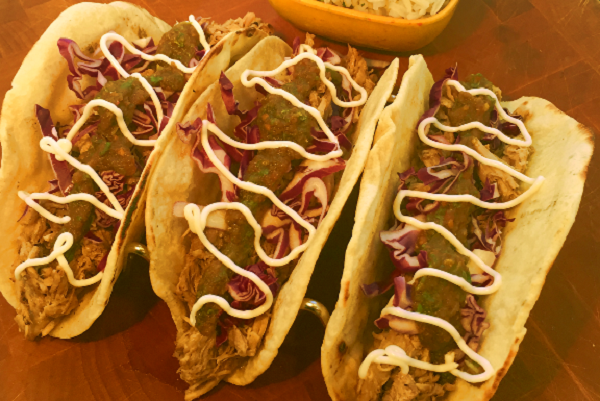 Slow cooked seasoned pork that's perfectly crispy, shredded and stuffed into flour tacos then dressed with cabbage, fresh roasted salsa and white crema. Served with a side of cilantro rice. A ready to reheat, hassle free weeknight dinner. Reheat pork, tortillas and rice. 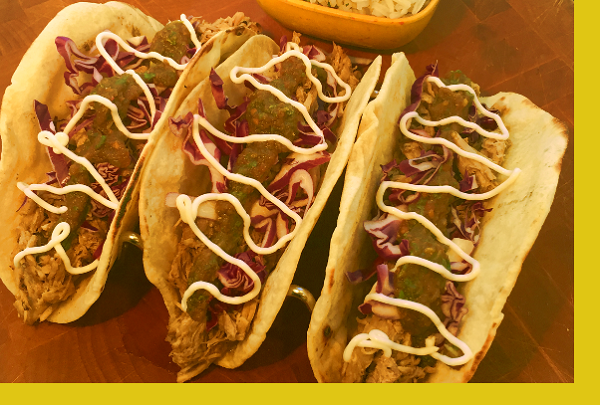 Assemble with cabbage, salsa and crema. enjoy! My whole family loved this meal! The pork was tender and juicy, and a bit bland on its own (which was good for the kiddos) but with the addition of the salsa, cream, and cabbage it was perfect! We will definitely be ordering this again! Loved it...turned them into Tostados. My family enjoyed the tacos. I did not. Everything tasted bland to me, I thought it would taste like the barbecue kind. This I will not order again. These were very good, easy and quick. That All. Crazy, crazy, crazy good. The flour tortillas are fresh-- nothing like store-bought. Think Lupe's. I've never had pulled pork with so much flavor. Cabbage was the perfect crunch and the sauce was great. And the salsa! Fresh and fantastic... so much so that we ate it with chips before it had any hope of decorating our tacos. We could eat this every week.